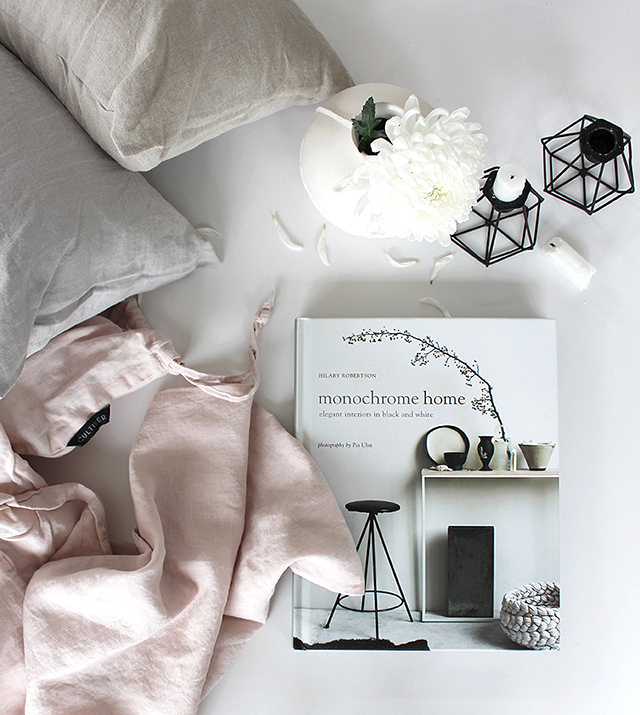 Do you remember the Monochrome Home book that I included in this recent wishlist? It arrived the other day and while I have been too busy to read it cover to cover, just flicking through it has had me lingering upon several incredible homes in awe. 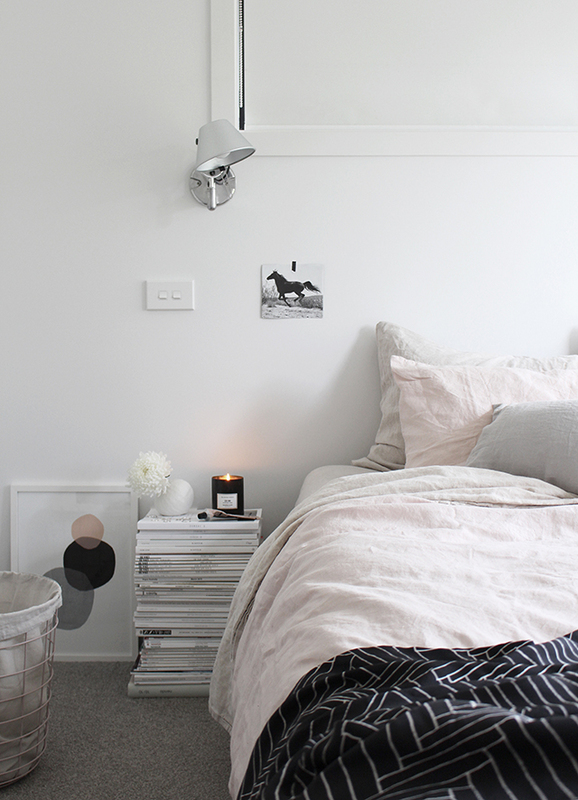 Page after page of stunning interior inspiration thanks to its author, sought after stylist Hilary Robertson and photography by the renowned Pia Ulin, it's a must have coffee table book for all you fellow lovers of monochrome spaces. Another exciting arrival that day was my new CULTIVER bedlinen. 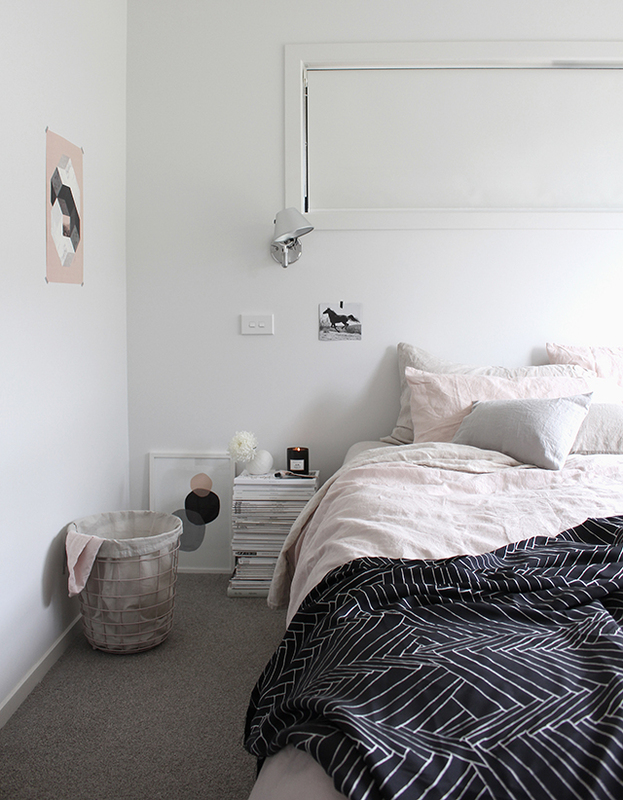 So obsessed with linen, I had been wanting another linen duvet cover for some time and couldn't be happier with my new Blush set. Part of the new colour range that I featured here, it's even prettier in real life and looks right a home with my CULTIVER Linen Sheets in Natural. You will no doubt recognise the incredible Penney + Bennett Black Thatch Silk Throw that I used in this bedroom shoot last year. A local brand that I love collaborating with, they very kindly sent it to me as a gift and I am in love. 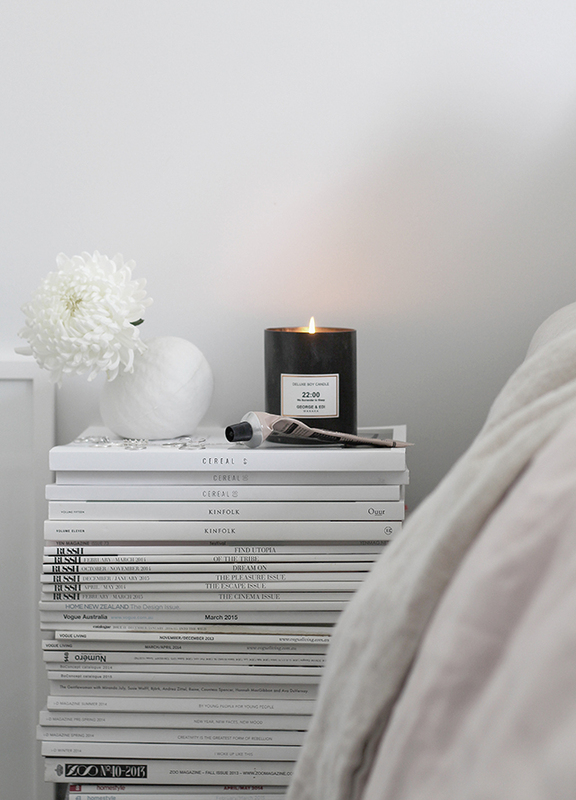 The gorgeous candle on my bedside is one of the new Deluxe Range of candles from George & Edi, a boutique home fragrance brand based in the beautiful resort town of Lake Wanaka, New Zealand. If you follow me on Instagram you would've noticed them popping up in my feed, including the shot below when they first arrived on my doorstep, beautifully packaged and causing my heart to skip a beat! Celebrating a love of craftsmanship and understated luxury, the new range includes two new fragrances. 22:00 'we surrender to sleep' has been designed for after dark, hence its position by my bed. With lavender to relax, jasmine to soothe away anxiety and hints of leather and amber, not only will it help you get the perfect night's sleep, it smells absolutely divine. 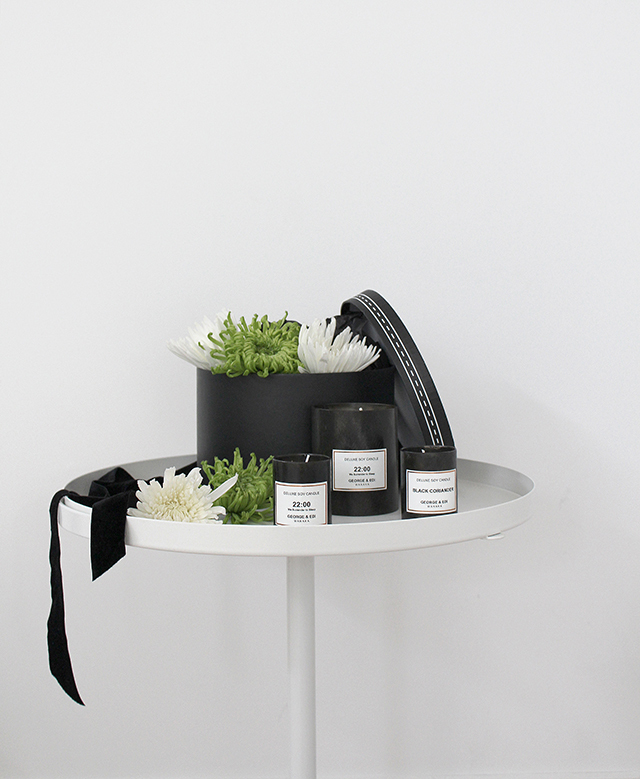 Black Coriander is a lovely blend of green coriander, black peeper, patchouli and cedar wood. A unisex fragrance that isn't too sweet, it's already become a favourite. 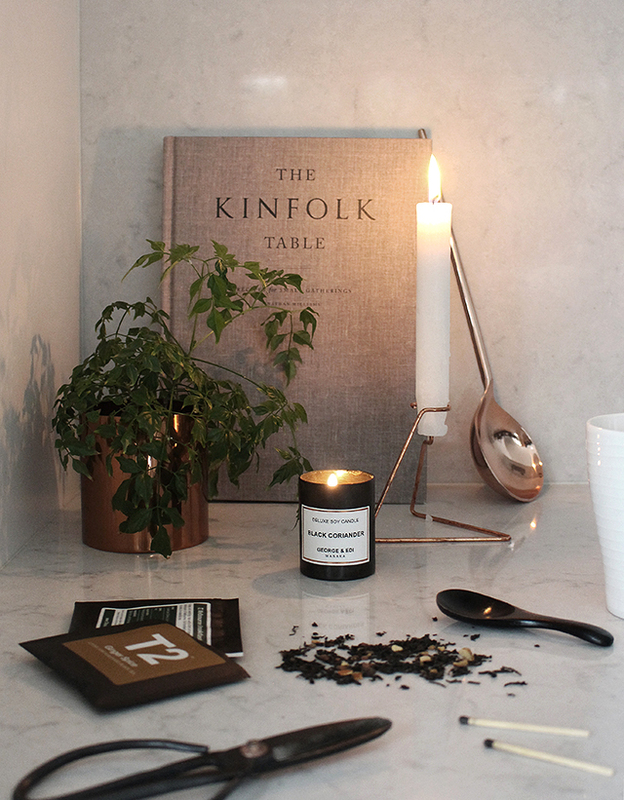 Making these candles even more special are their unique handcraftted brushed steel vessels. Produced in collaboration with sculptor Ernie Maluschnig and his team at Metalworks Wanaka, they have an amazing textural look and feel. You really have to see and feel them to appreciate their uniqueness and cool industrial vibe. To celebrate the lunch of the Deluxe Range, George & Edi have produced 50 Limited Edition Mini Deluxe Candles which make the perfect little collector's item to treasure and cherish. Visit George & Edi to shop the new range online, and while you're there make sure you check out their full range home fragrance products. Your blog is eye-catching. I get pleasure from it. Thanks for sharing this beautiful Picture Sharing here .